It really depends on my mood. WHEN I tip I give a R5 but I don’t tip often. I prefer to say my small change for the guy selling the funnies on the side of the road. Going to the UK was such a culture shock as I had NO CLUE how to pump my own petrol. Once you get used to it though, it’s ok. Winter times are not fun, standing around in the freezing air, trying to get your fingers to work, and then having to run and stand in a queue inside the shop. Nah, I prefer our way. Not only do we provide employment for 1000s, but you get to shoot the breeze with someone, and in winter you get to stay in your nice warm car (that part is definitely selfish!). But when my kids learn to drive, I’m definitely going to get them out of the car and teach them how to pump petrol so that when they do the overseas thing they’re not completely incompetent like I was. How interesting and yes living here in the UK we do get out of our car to fill with petrol and check tyre pressure etc..it wasn’t always this way and I do wish we would go back to the ways of some-one doing it for us as you have in SA. I remember driving through Los Angeles last year, in an oversized minivan rental, and looking for petrol. The GPS wasn’t helping too much, but I spotted a petrol station on one of the side roads it had guided me to where I faced the South African’s dilemma: how the hell do I fill my own tank??? So I went inside and asked the owner for help. The minivan I had, had NY plates, so he asked if I was from New York. When I told him I was from South Africa, his face lit up in an instant! He was from Egypt and had immigrated to the US some 5 years before! Despite SA & Egypt being far apart geographically & culturally, our Africanness was an extremely happy common ground: For him to meet someone from his ‘home’ continent, and for me, being a stranger in a foreign land, to have a sense of not being alone for a few wonderful minutes. Talking about the state of Africa ensued, about social ostracisation of non-muslims in Egypt, about better educational opportunities for his children in America. I generally tip the guys 5 bucks, except if they make no effort. Yeah, as Nixgrim and Henk said, visiting other countries where you have to pump your own fuel will be a bit of an adventure. Paul: been there, done that too. In the UK, many major retail chains (Waitrose, Sainsburys, etc) already have self-check outs. You scan your own items and put them in a bag that sits on a weight sensitive pad, to ensure that you don’t steal any items by simply putting them in the bag without first scanning). You can’t pay in cash, so have to use your debit/ credit card. There is also always a staff member on duty watching these tills too, to avoid shoplifting, and to assist if you get stuck. Personally, I find them more hassle than they’re worth, but if there are long queues elsewhere in the store, then they were often the quickest way to buy your stuff and get out of the shop, because most people avoided them, meaning they always had the shortest queues. In Canada they have ‘self serve’ and ‘full serve’. You pay more for a full serve station that has an attendant that pumps gas for you and even in -40 degree weather, no one tips the attendant! I usually tip about R2 here if they do the windows too. very nice and good post! In some countries you dont have to pay extra for a full serve stations and i found it much better way than tipping. 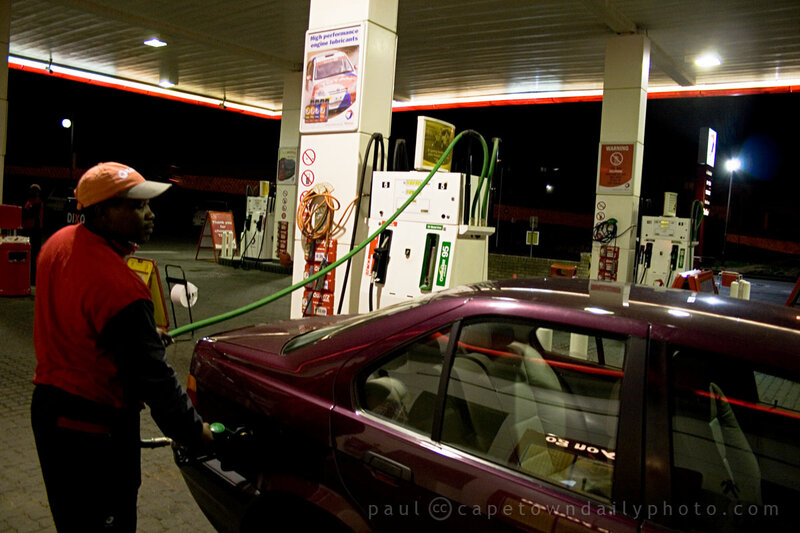 No filling station in SA may be operated without attendants. this is to create work for people in a country where there is a large number of unemployed people . Everyone accepts this as part of the social system in the interest of all south africans . It is NOT because South Africans are lazy! Thanks for the information – are you saying that it’s law? If so, I find it hard to think that the law would have been created with the intent of creating employment… not that I can imagine anyone would have a problem with it if it were… the more jobs the better, hey? I think Nixgrim made the point that it’s not laziness, but more a custom – the way we do things – much like having waiters in restaurants, or domestic workers who help at home. Lazy South Africans, I dont think so. It creates jobs which is very much needed. Many of the poorest of the poor rely on these jobs in order to support themselves and family. I would rather say thank God we still employ people to to this job. If you take away these jobs the poor only get poorer. Thanks for your comment. Perhaps you interpreted what I was saying differently to how it was intended. I did actually think before I wrote – I don’t believe I suggested that we should not employ parking attendants – that we should take people’s jobs away. That would be silly in a country where unemployment levels are so high. Someone mentioned in the comments that it’s no different to having servers at restaurants. It’s also why we don’t mind tipping parking attendants, even when we don’t really need their help. (Which, by the way, isn’t always the case – they’re sometimes darn useful).